Sky TV Packages, What are the different Sky packages? Sky TV has a variety of TV channel bundles packages. Know more about what you will get from the TV pack of Sky TV UK with the cost? The sky is ready to launch a new set-top box and related services under the brand SkyQ on Wednesday in an attempt to convince customers to upgrade their existing Packs to HD pack. Here is the detail of Sky TV packages with channel detail and price. Price: £10 per month for six months, then £20 per month. TV channels detail of original sky pack: 35 entertainment channels, including Sky Atlantic, the house of Game of Thrones, Sky1, and Fox. 11 free to air HD channels along with 240 free to air TV channels. Another service of Sky with this pack include Catch-up TV, Sky + (pause and rewind live TV and record two programs simultaneously) and Sky Go (Live-TV from Sky on a laptop, mobile phone or tablet). Is there anything else? Yes, Free Sky + HD box worth 2TB £249. The Sky Movies Pack, How much is sky movies a month? Sky Movies pack price: £18.50 per month for six months, then £37 per month. What you get with Sky movies pack: 35 entertainment channels, 11 Sky Movies TV channels, Sky Movies Disney, more than 1,000 movies on demand, the ability to see new movies from the online subscription services. 11 free to air HD channels and 240 free to air TV channels. Another service of Sky TV with Sky Movies pack: Catch up TV, Sky + and Sky Go. Is there anything else? Yes, free Sky+ HD box with 2TB storage worth £249. 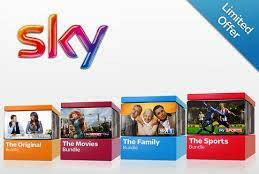 Sky Variety pack price: £20 per month for six months, then £30 per month. What you will get: More than 75 entertainment channels, including documentaries, more than 1,900 episodes of children's programs. 11 free-to-air HD channels and 240 free-to-air television channels. Other Sky services: Catch up TV, Sky+ and Sky Go. Sky TV family pack price: £26 per month for six months, then £36 per month. What you Will get: More than 75 entertainment channels, including documentaries, more than 1,900 episodes of programs for children, more than 300 box sets including primary and Sopranos, Sky 3D. More than 50 HD channels and 240 free to air TV channels. Is there anything else? Free Sky+ HD box worth 2TB £249. Sky TV Sports package price: £35.50 for six months, then £45.50 per month. More than 35 entertainment channels, 11 HD free to air TV channels and 240 other FTA channels. Other services: Catch up TV, Sky+ and Sky Go. Is there anything else? Free Sky+ HD box with 2TB internal storage worth £249. Sky TV complete package price: £61.25 for six months, then £75.75 per month. What you will get: Over 75 channels of entertainment, including all Movies TV channels, documentaries and sports channels with kids channels. More than 50 entertainment channels in HD, more than 1,000 films and over 300 boxes. 11 free to air HD channels and 240 FTA television channels. Other Sky TV services: Catch up TV, Sky+ and Sky Go. Is there anything else? Yes, free Sky+ HD set top box worth £249 with 2TB internal storage. All packages have a rate of £10 set up fee and at least 12 months contract.